Last month, 50 participants from EADA’s finance masters took part in an international business trip to the financial capital of Frankfurt. Company visits are an integral part of all three Master programmes, as they provide students with an opportunity to see case studies in action. 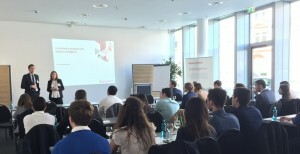 Participants from the International Master in Finance, International Master in Accounting & Financial Management and Master Internacional en Finanzas – Bilingüe visited Deutsche Bank, the European Central Bank, KPMG and BearingPoint Consulting in Frankfurt in April. Miguel Guerras (Spain) from the Master Internacional de Finanzas – Bilingüe, took part in the trip to share new experiences with classmates and learn more about how different financial companies and institutions worked. International Master in Finance participant Luis Mejía (El Savador) describes the opportunity as a “unique experience” in which participants were able to “listen to the people in charge of shaping the world’s economy and discuss the prospects for the future”. The intense two-day visit began with a stop at Deutsche Bank where Dr. Michael Adams, Vice President of the Corporate and Investment Bank on Corporate Forex Risk Management, gave a presentation, followed by an open Q&A session on the banking sector. 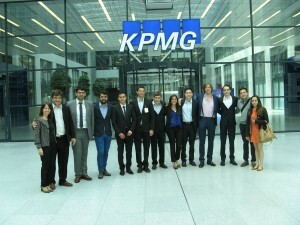 After lunch, students split into two groups to visit the offices of BearingPoint and KPMG. During the visits, participants learned first-hand how two leading consulting companies work and made valuable contacts for the future. On the second day, participants headed to the European Central Bank, where they were given a guided tour of the new building, followed by an in-depth presentation on macro-economic developments in the Eurozone by Senior Economist Dr. Arne Gieseck. After the presentation, students discussed the current challenges for the Euro area, the implications of Brexit and convergence issues following the financial crisis. “The experience was enriching, as it gave us a snapshot of how our lives could be after graduation,” says International Master in Finance participant Erika Christ (Guatemala/Germany). Classmate Tommaso Allegri (Italy) agreed, describing the value of the opportunity in terms of future professional opportunities.